Syrian government forces captured the village of Tel Hadya in the northern province of Aleppo on Friday, a monitoring group and state media said, in the latest territorial gains reported against insurgents in the area. The reported advance brought pro-government forces closer to the main highway that links Syria's major cities, building on other gains made in the area with support from Russian air strikes. There was no immediate comment from rebels, including al Qaeda's Nusra Front, who have been in control of the area. Fighting has intensified even as world and regional powers prepare to meet in Vienna in a bid to step up diplomatic efforts to end the four-year-old conflict. Syrian state TV reported the takeover of Tel Hadya and the Britain-based Syrian Observatory for Human Rights, which monitors the conflict using sources on the ground, confirmed it. The advance came a day after the Syrian army backed by Lebanese Hezbollah fighters, Iranian troops and Russia air raids took the nearby town of Al Hader, effectively bringing government forces in control of most of the southern Aleppo countryside. "The southern Aleppo countryside is falling hill after hill... the army is advancing quickly," the Observatory's Rami Abdulrahman told Reuters. The advances could provide a launching pad to push further against insurgent strongholds in mainly rebel-held northwestern Syria. The Kremlin believes the Syrian army's offensive is effective and that, with the help of Russian air strikes, the Syrians are making good progress, Russian RIA Novosti news agency said on Friday. Russia launched its air campaign in support of President Bashar al-Assad on Sept. 30, ostensibly to fight Islamic State militants. But raids have mainly targeted other insurgent groups, some foreign-backed, in the west of the country, the United States says. The campaign appeared to be making little headway in terms of captured territory until the latest advances in Aleppo province. Government troops also broke an Islamic State siege on an airbase elsewhere this week. 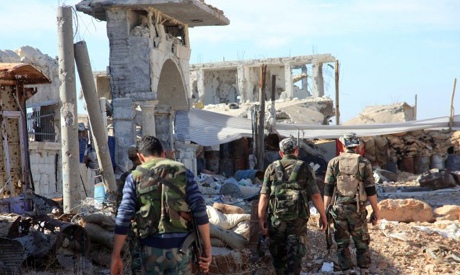 Rebels have made advances elsewhere, including in Hama province.